The calendar says soup, but the weather says salad. 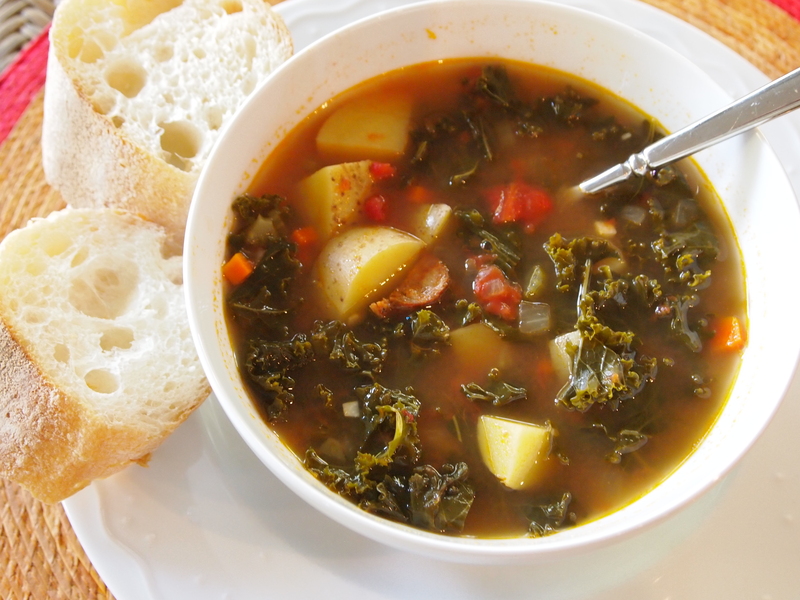 Nonetheless, the kale is so fabulous at the farmer’s markets that I decided to make a kale-based soup today. We went for a walk today in the Big Woods State Park south of Minneapolis, and I thought it would be great to come home to an already prepared meal. If it were actually cold out, I would pair this with a hearty sour rye or multi-grain bread, but baguette seemed perfect given the warm weather. 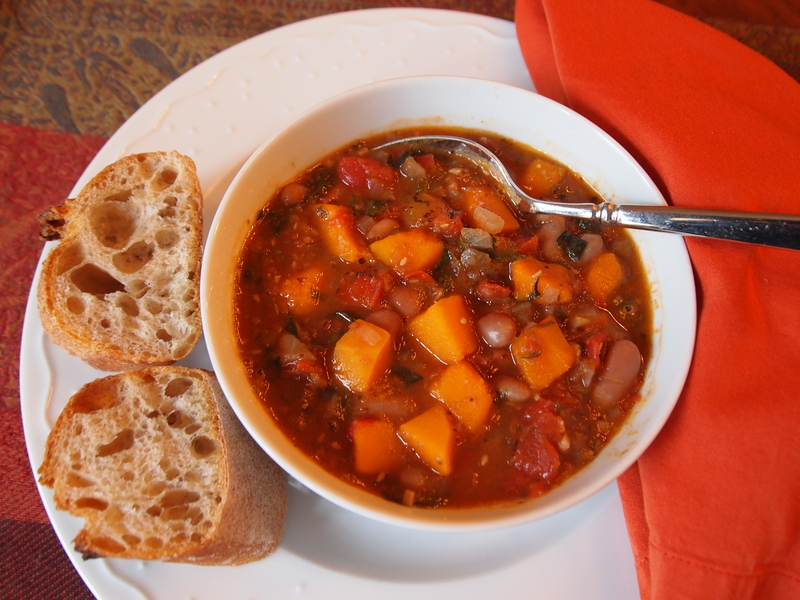 A light red Cotes-du-Rhone is a nice match for the flavors in this soup. Heat a soup pot of at least 6 quarts capacity over medium-high heat. Coat the bottom of the pot with olive oil and heat to shimmering. Add the carrots, celery, onion and rosemary to the pot. Turn down the heat to medium and saute for 4-5 minutes. Add the garlic and chorizo and saute for another 4-5 minutes until the vegetables are soft and starting to brown a little. Add the tomatoes and cook for a couple of minutes. Next add the wine and simmer for a few minutes to burn off the alcohol. Add the liquid of your choice (I used chicken stock) and the thyme sprigs; stir to blend. Bring to a boil, turn down heat and simmer for 30 minutes. Remove the thyme sprigs, taking care that the leaves remain in the soup. Add the potatoes and simmer for 10 minutes. If you like a thicker soup, you can simmer for up to an hour to break down the potatoes. We like a brothier soup and “just done” potatoes, hence the shorter cooking time. Add the kale and simmer for 15 minutes more, making sure not to overcook the kale. Taste and then add salt and pepper. I did not put in additional S&P since the oven roasted tomatoes had plenty as well as the homemade chicken stock. We added a tiny amount of each at the table. NOTES ON INGREDIENTS: Either fully cooked Andouille or Chorizo sausages, pork or chicken, would be great in this dish. If you do not add the sausages, I recommend 2 teaspoons smoked paprika added with the tomatoes. I used “regular” green kale, but Lacinato would be excellent also. I did not peel the potatoes out of personal preference. If you want to thicken the soup a little, I recommend peeled russet potatoes over the Yukons. 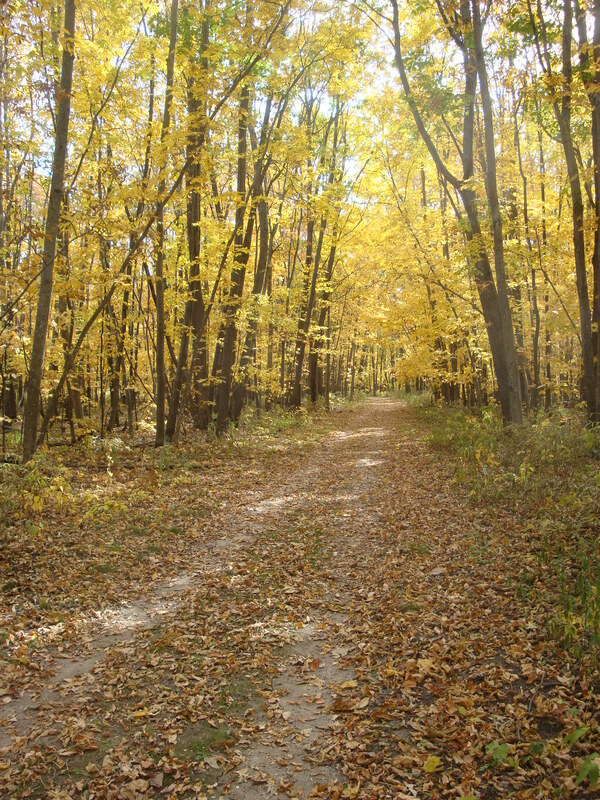 And it was a beautiful day for a walk! 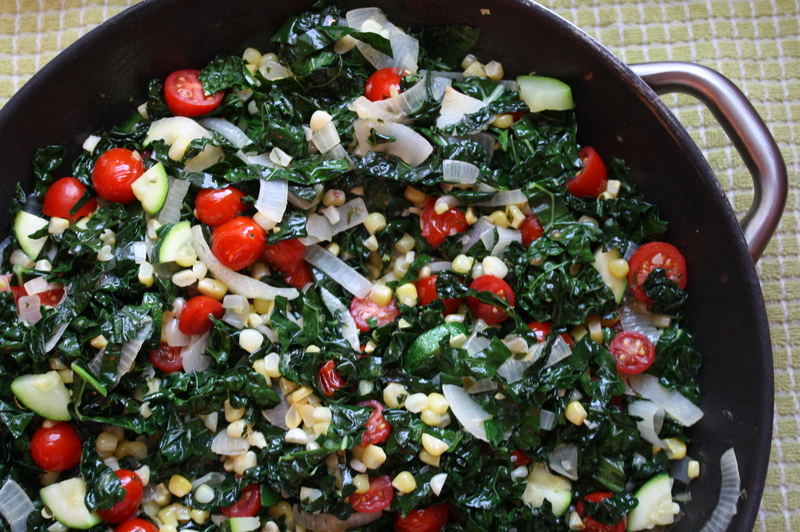 If you read our blog, you know how much we love cooked greens! Even as a greens enthusiast, when I saw this post on a favorite blog, Green Your Plate, I thought it sounded like an odd use for cooked greens (even if it was adapted from a Rick Bayless cookbook)! 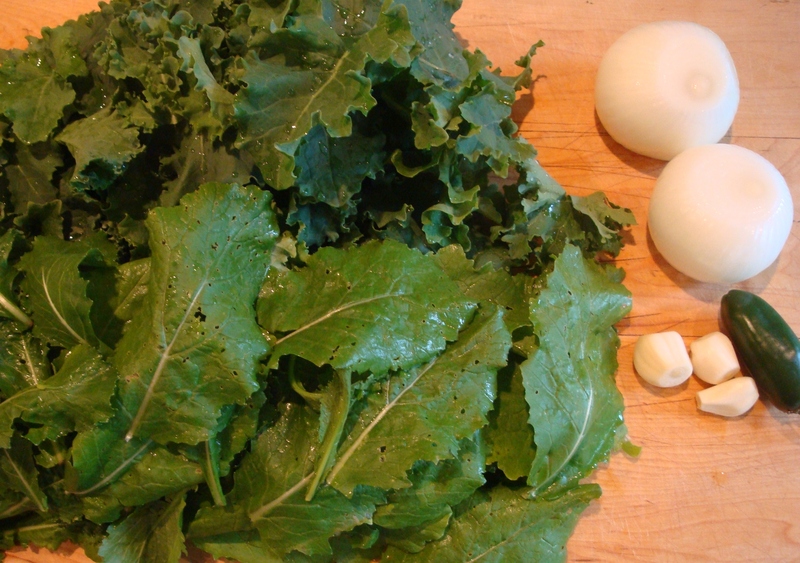 However, the recipe showed up on the very day that my neighbor gave me a big bunch of young kale. Plus I had a bag of turnip greens leftover from a recent batch of Turnip Risotto and a pretty large piece of leftover cooked salmon in the fridge. Since I had everything on hand except the tortillas, I felt the cosmos was conspiring for me to make these! Randy and I both agreed that we would make this recipe again . . . maybe often. These tacos are a great weeknight meal option, taking less than 30 minutes to prepare. You’ll see in the notes on the ingredients that there’s lots of flexibility in types of greens, tortillas and salsas, so you can utilize what’s available at the market and on hand in your pantry. Randy had a Pilsner beer and I had a glass of Sauvignon Blanc – both good matches. If you like greens, I recommend browsing through Green Your Plate – Amy has several recent posts about the wonderful greens that are available at our farmer’s markets throughout the season, along with a recap of a demo she did at our main farmer’s market on cooking with greens. 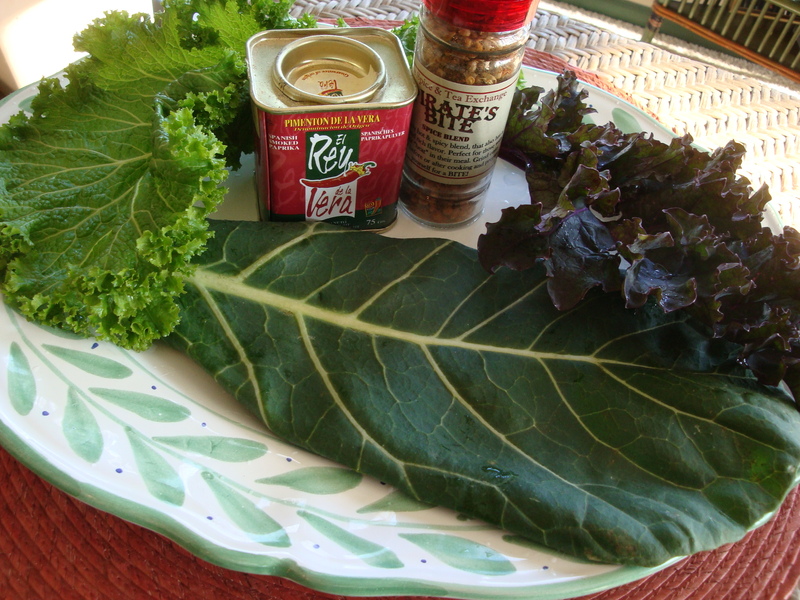 Greens – If using tender or young greens, leave them whole. If using tougher or more mature greens, remove the center ribs and chop into 2-inch pieces. 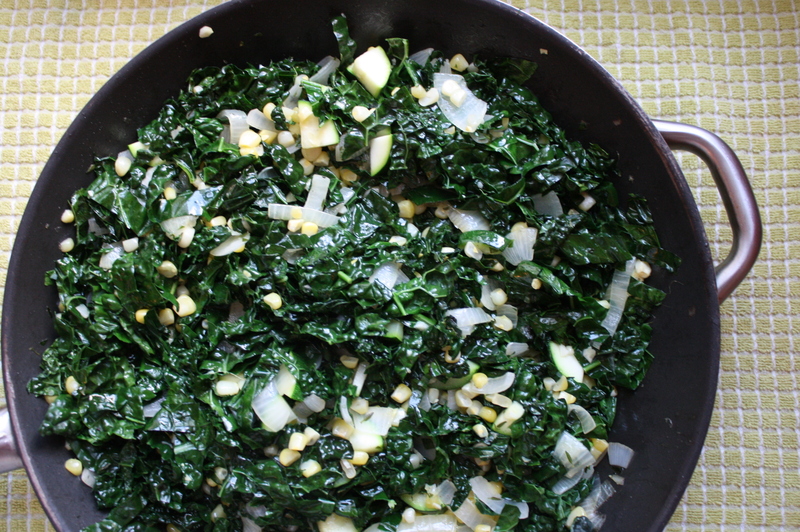 Swiss chard stems can be cut into 1/2-inch slices and sauteed along with the onions. Tender greens will cook in 1-2 minutes and likely not require water other than that left on the greens from washing. Tougher greens will take longer – up to 10 minutes for mature collards – and will need more water. Tortillas – I recommend flour tortillas for bitter greens (kale, turnips, collards) and corn tortillas for sweeter greens (spinach, beet tops, chard). 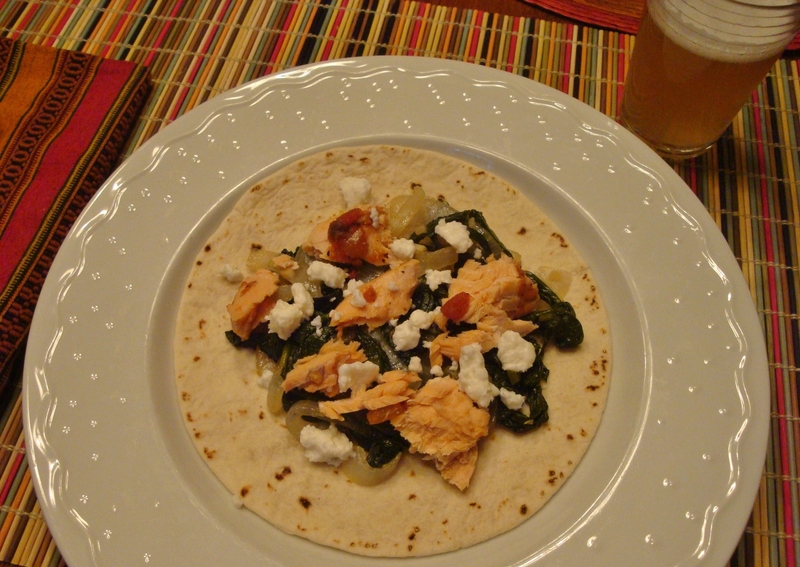 Optional Fish/Meat – The salmon was delicious with the bitter greens and I think the chorizo or andouille would work with them also. Salsa – I recommend smokey chipotle salsa for the best match for bitter greens. I would use a lighter, fresher salsa for sweet tender greens – maybe even a pico de gallo. Heat the oil in a large saute pan over medium-high heat. Add the onions and cook, stirring constantly, until they begin to brown, but are still fairly firm. Add the garlic and jalapeno pepper and cook for another minute. Add the greens a little at a time and stir to wilt. 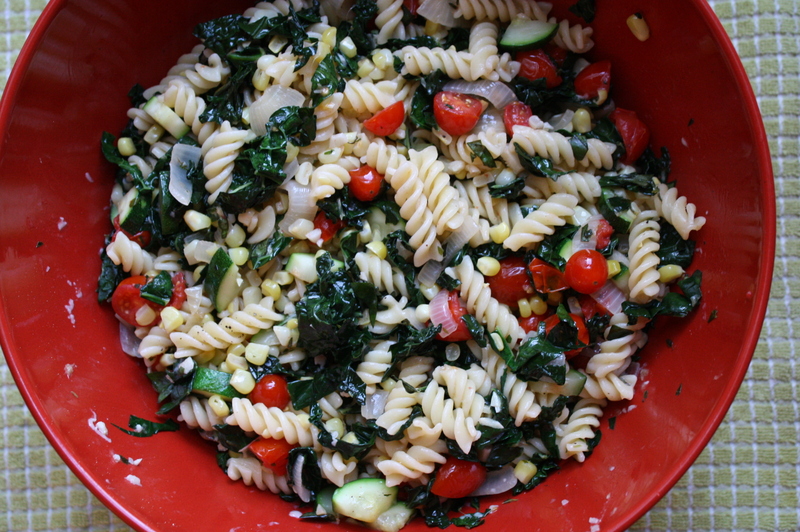 Add the water if using tougher greens – I used about 1/3 cup for the kale and turnip green combo. Turn the heat down to medium and cover to cook till tender, but not mushy. This took about 6 minutes for the kale/turnip greens. Remove the lid and turn up the heat to cook off the liquid. Add the lemon zest and remove the pan from the heat. In the meantime, warm the tortillas in foil in the oven. To assemble the tacos, place a little of the greens/onions mixture on a tortilla. Top with the cheese and fish or meat, if using. Pass the salsa. NOTES ON INGREDIENTS: The original recipe called for spaghetti, but I thought it would be easier to eat with small pasta shapes. We used Strozzapreti, having just gotten some on sale. We used 2 hot and 2 mild Italian sausages made with turkey – pork would also be delicious. We used Lacinato kale (also on sale! ), but I think the curly would work just as well, although it would take longer to become tender. DIRECTIONS: Coat the bottom of a large Dutch oven with olive oil. Heat to medium high and add the sausage meat. Brown till just done breaking up into pieces. When done, remove the sausage and set aside. Wipe out any stray bits of sausage from the pot, but leave all the good brown stuff – the fond – in the bottom. Put in a little more olive oil and add the onion. Saute over medium heat until soft, scraping up the bits off the bottom of the pan. I found that those bits started burning a little after about 3 minutes, so I added a small amount of the beer to deglaze the pan. Add the garlic when the onion is soft and stir for a minute till it becomes fragrant. Add the prepared kale and stir until it’s wilted – you might have to do this in more than one batch. Add the cooked sausage and the beer, bring to a bubble, reduce heat and simmer for about 15-20 minutes until the kale is tender. In the meantime, cook the pasta according to directions till al dente. Drain, saving 1/4 cup of pasta water. Stir the mustard into the pasta water and then add, along with salt and pepper, to the kale-sausage mixture. Add the Parmesan and stir to blend everything. Stir in the pasta and heat back to serving temperature. Serve in bowls and pass the extra Parmesan. Make the dressing by combining the fennel, olive oil, red wine vinegar and lemon juice, mustard and salt and pepper. Whisk until slightly emulsified. Combine the greens and the mint, then wash and dry. Place in a salad bowl and toss with the dressing. Garnish each bowl with a couple of mint leaves. This salad is a refreshing Wow! This recipe in Bon Appetit caught my eye for a number of reasons. 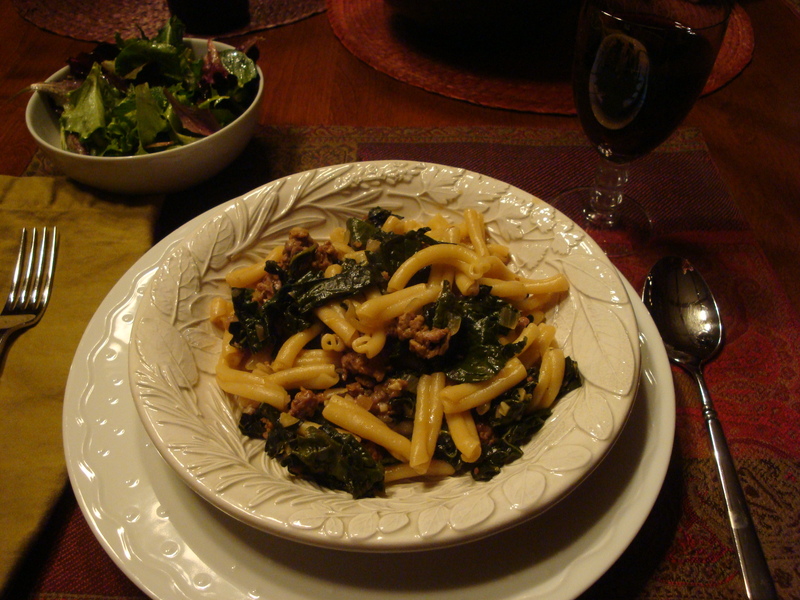 I love, love, love cooked bitter greens for one, as you know if you read this blog regularly! 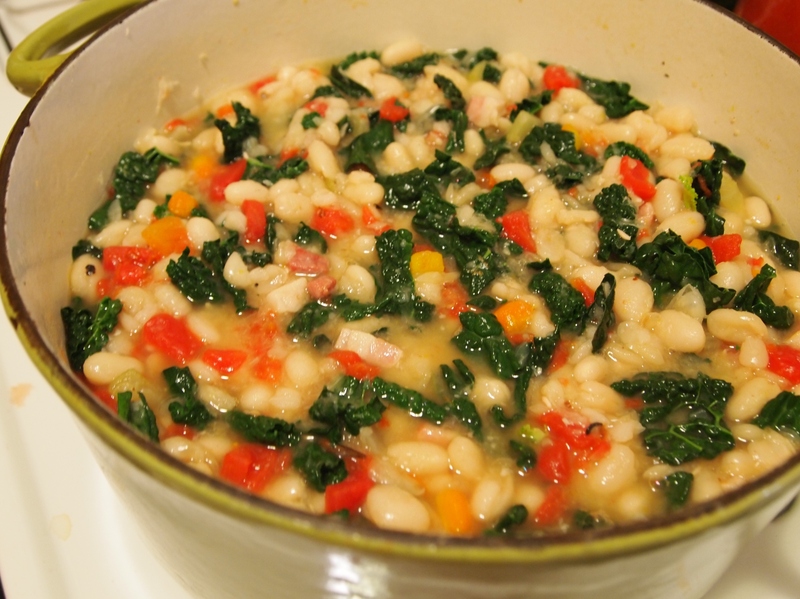 I imagined that it would be delicious as it’s a cousin to another stew recipe we’ve posted with white beans and Swiss chard. I’ve also been looking for things to do with the smoked paprika I have on the shelf, and I just ordered something called Pirate’s Bite, a combination of dried hot peppers, spices and salt (from The Spice and Tea Exchange). Lastly, I’ve vowed to eat a vegetarian diet for a few of weeks after coming off a couple of months of rich food. So this dish fit the bill in a number of ways! 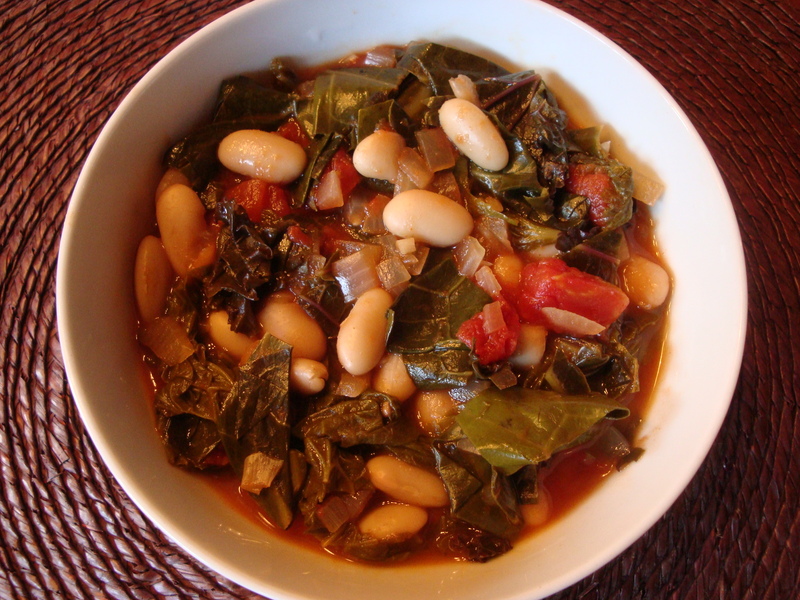 And like the stew with chard, it is a snap to make. Prepare the greens by washing thoroughly, removing the tough inner stems and coarsely chopping in 2-inch pieces. I used a combination of all 3 greens – 1 bunch each – which added up to about 25 cups! Don’t be alarmed by this amount since they cook down dramatically. Set aside. Coat the bottom of a Dutch oven with the olive oil and heat to medium-high. Add the onion and saute till soft, about 5 minutes. Add the garlic and saute 1 minute more. Add the smoked paprika and saute for about a minute. Add the tomatoes, their juices and the liquid. Stir in the greens a little at a time until wilted. Bring to a boil, then turn down the heat and simmer for 15-20 minutes until the greens are tender but not mushy. Add the beans and chili flakes or Pirate’s Bite. Add more liquid if you want a brothier stew. Stir to blend and heat through. Serve in bowls and pass the cheese. (I thought this was delicious without the cheese, but try for yourself and decide.) Addendum Oct 9, 2011: I’m busy stocking my freezer this year for the winter and think this is a good candidate. I have frozen a couple of batches of this recipe without the beans, with the idea that I will add them when reheating.